Here are some tips to help you with your SEO on product pages in your ecommerce website. Just for fun, I’ve used gingerbread as an example. 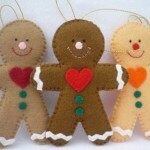 It’s a gingerbread man template for quilting, not the delicious gingerbread men for eating! Just as well the Christmas and Holiday season is over and the New Year diets have begun! If you use the manufacturer’s description of the product, then the copy will be the same as many other websites around the world. It is a missed opportunity for you to differentiate yourself from other shops. Google does not like duplicate content so it won’t help your rankings either. Take the extra time to write your description of the product and include some information you have gained from your experience with the product. If you are not a writer, then making some notes with the key points you feel should be included and get a copywriter to put together a well-written product description. While it is true that a picture or a photo says 1000 words, Google cannot see the images, so use words to describe the product. Having great images is essential. But did you know the importance of including the alt tag and naming your image file well? The alt tag gives an alternate text if the image cannot be displayed or is not displayed for other reasons, eg if a user is using a screen reader because they have a visual impairment. The alt tag should not just be a repeat of your product title. For more details: SEO for images. You can see if someone was searching for Christmas ornaments and gingerbread men the alt description is going to help. See the wording above beginning “Our Gingerbread man template… ” That is the meta description, it is the wording that shows on a google search, and you skim read it to decide if you want to click on that click. Make those words inviting. They are a great way that for creating unique content for each product. The Product schema tells the search engine more about the product. The Offer schema includes more information on price and availability, like currency and stock. It shows the price of the product and if is currently in stock. I like to use the Yoast Woocommerce plugin which does this for you for WordPress Ecommerce sites. When someone shares a product on Facebook, you want the image to look good not small and grainy. The Open Graph information also means for example that if someone pins one of your product images, it will include the price of the product and if it is out of stock. It will also show anytime it is on sale. 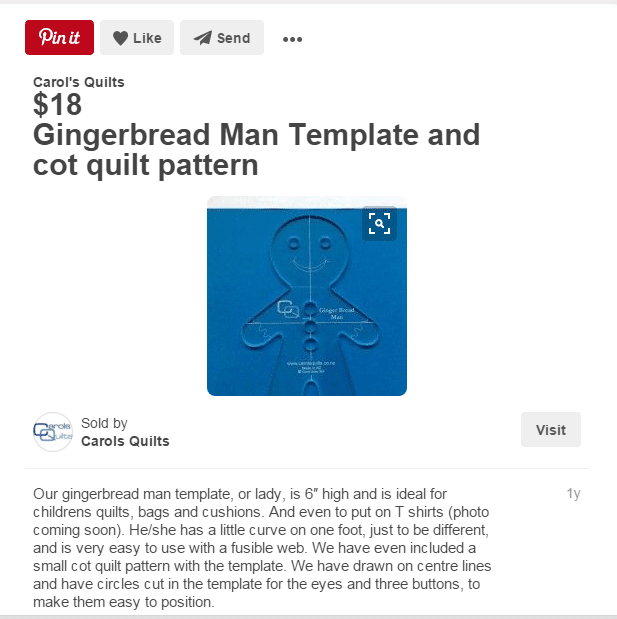 See the example below of the gingerbread man quilting template pinned with its product description! If you do all of the above, that will go a long way to getting your Woocommerce Product Page SEO sorted. It may be tempting to create lots of tags on your Ecommerce website. I suggest you don’t unless you have several related products that will fit the tag. Also, try to limit the number of tags you add to each product. Remember the creation of a tag also created a tag archive page. You may consider setting tags to no-index in Yoast. Thinking about a tag cloud? It can look like keyword stuffing, which is not good for SEO. It spreads page rank through the site, that can be good or bad. Google is interested in looking after your visitors, so if the tag cloud sends people deeper into your site to find what they want then it is good. A tag cloud should include only tags that already have lots of content. I suggest at least 3- 4 products for product tags or 3-4 posts for standard tags. Need some help with your small business SEO? I offer SEO packages for Small Business and Ecommerce Websites.